We’ve been working on this Slimming World Chicken Korma Curry for months trying to get it close to the Korma that comes from the Indian takeaway. Here it is! Even our small army of “Nommers” aka our taste testers, say it’s better than from the Indian takeaway! Now that is saying something, eh? It’s so close in texture and flavour. Saying that though, there are some essential ingredients that you need to make this Chicken Korma Curry recipe. 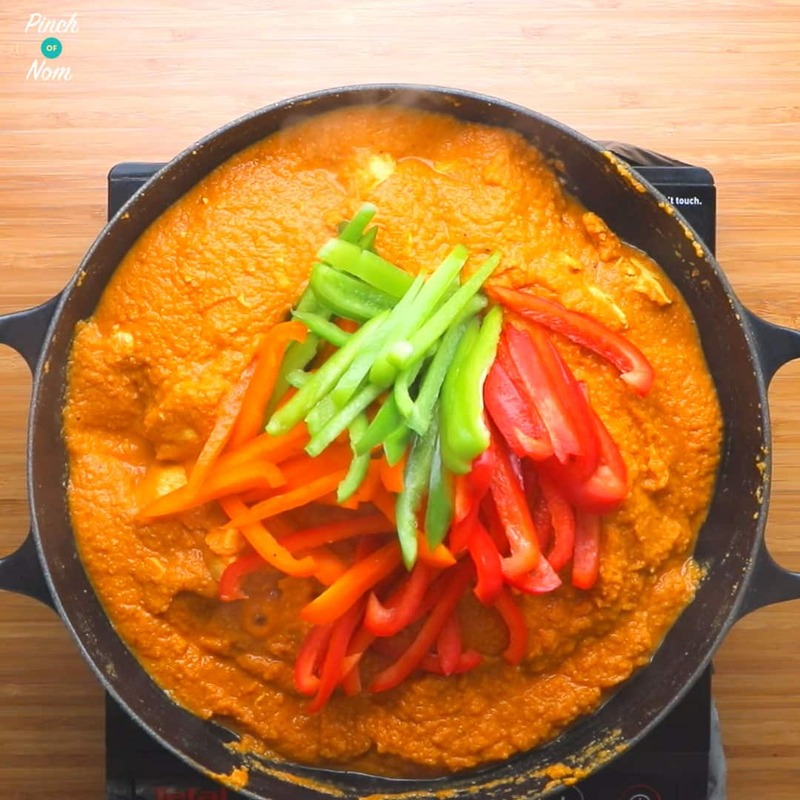 We used peppers as the speed food in this Chicken Korma Curry recipe, but you can use which ever speed food you like. You could even leave it out if that takes your fancy! 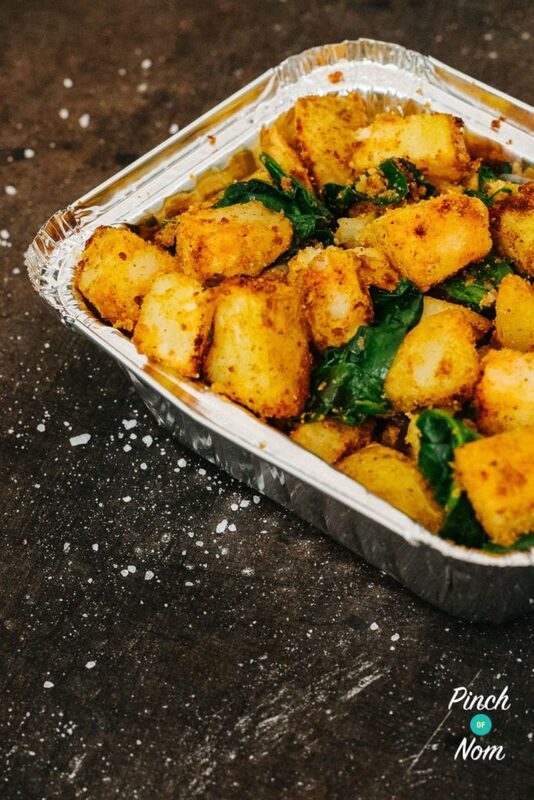 Why not serve with a side of our Saag Aloo for an even more authentic takeaway experience? 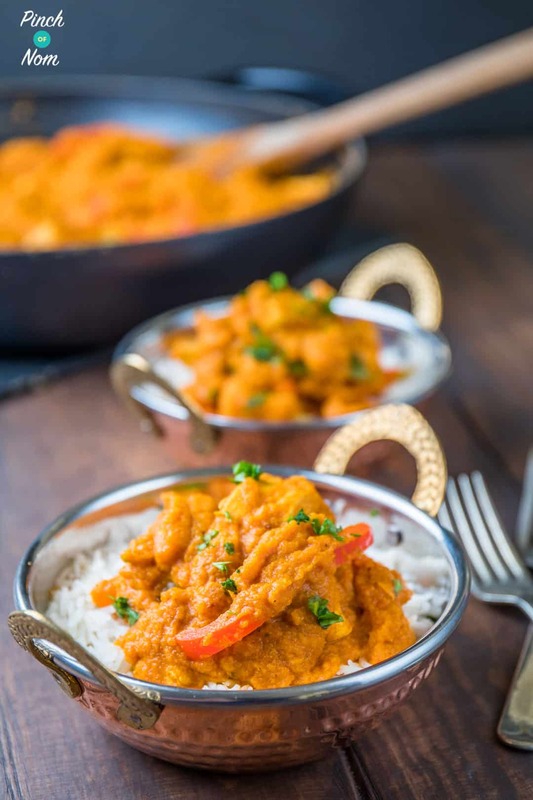 Some of you love this Chicken Korma Curry recipe! One of our Instagram followers @skinny_mooie made this dish and loved it! 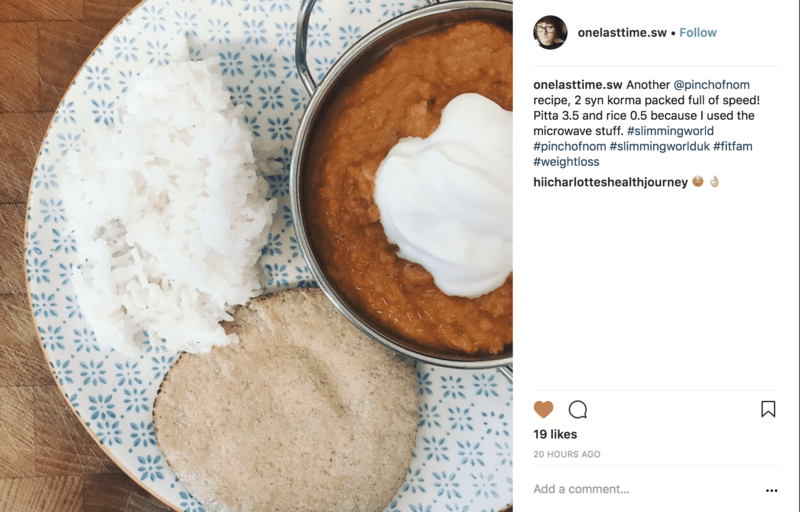 Another of our Instagram followers @onelasttime.sw made this dish and loved it too! 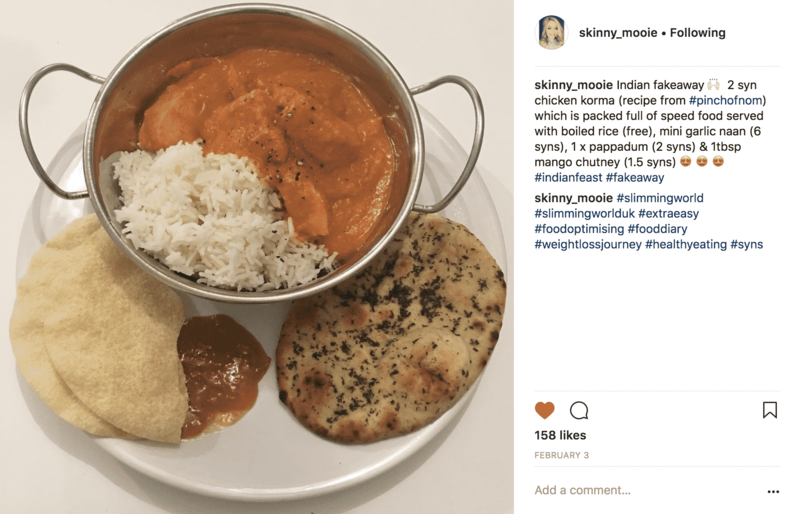 How many Syns are in this Chicken Korma Curry? There are just 2 Syns in this Chicken Korma Curry. A massive saving, as a takeaway korma can be as much as 16.5 syns!! How Weight Watchers Friendly is this Chicken Korma Curry? A takeaway Korma can be as many as 21 points!! That is a whole days allowance! Ours comes in at 3 flex points per serving, leaving you plenty of points for the rest of the day. It’s important that you use flour of some sort in this Chicken Korma Curry recipe, as this is what stops the Korma from splitting. 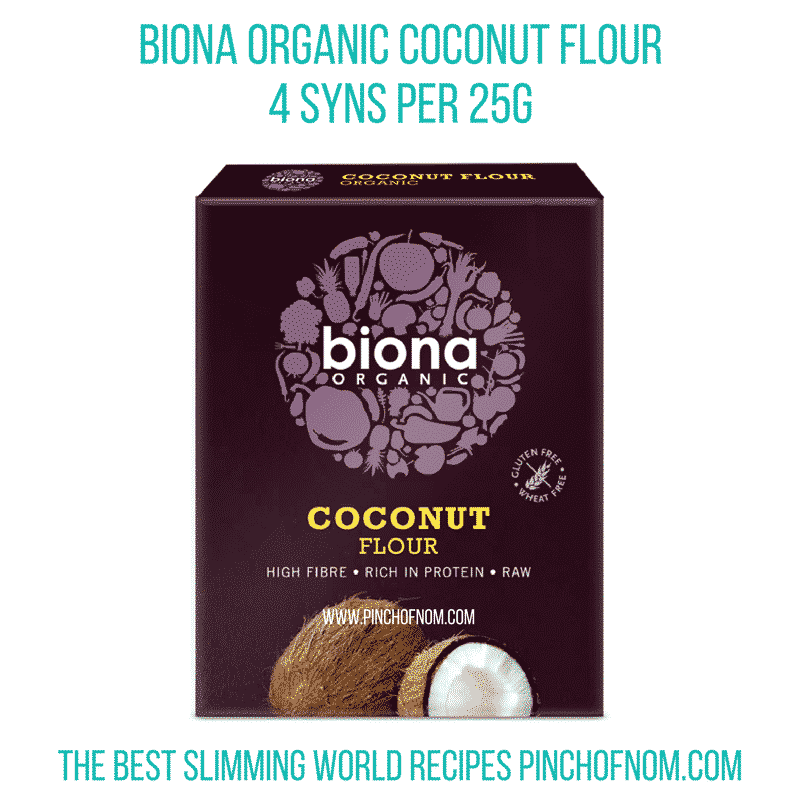 We used Sukrin Coconut Flour, which is reduced fat and only 3.5 Syns for 25g, but you can use any brand, but don’t forget to check the Syns. If you don’t have coconut flour you could use Almond flour or even normal plain flour. If you don’t use flour and the Flora Light – this Chicken Korma Curry will split. You really don’t want it to split! The 2 tablespoons of Flora Light is 4 Syns worth. These are the only things that need to be Synned which means that this 2 Syn Chicken Korma Curry recipe works out at 2 Syns per portion. 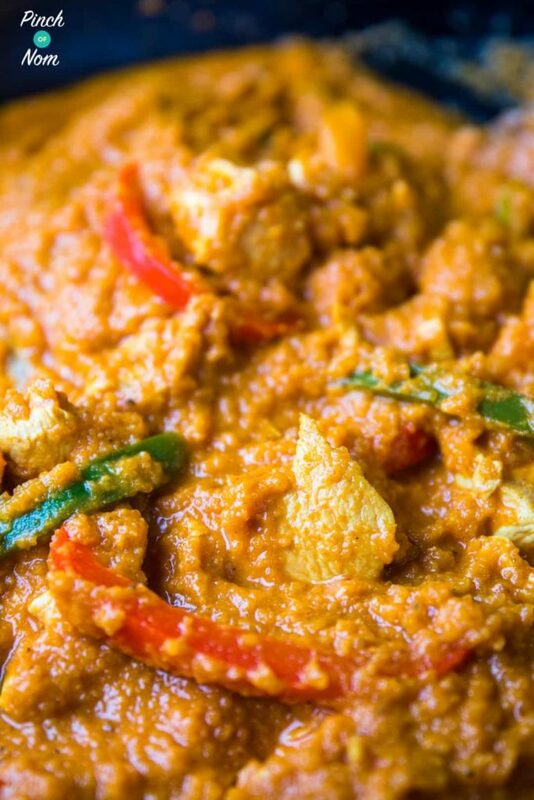 Want to see how easy this Chicken Korma Curry recipe is to make? Watch the video! 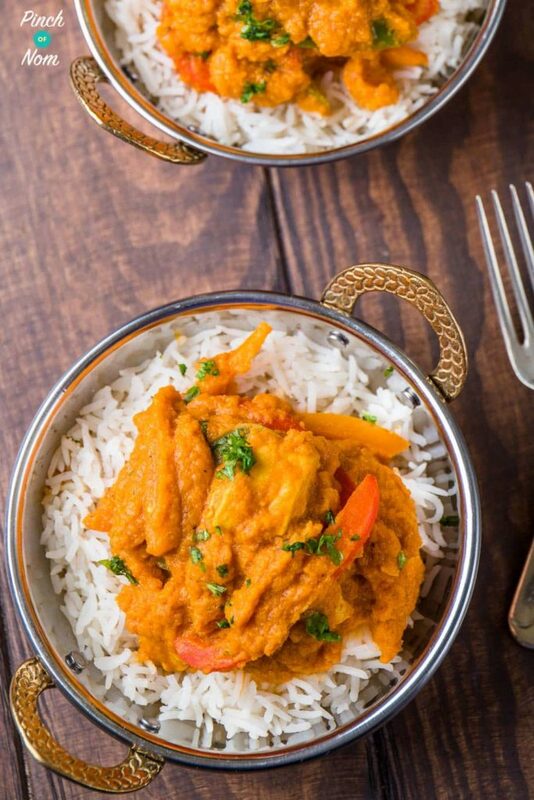 What do I need to make this Chicken Korma Curry recipe? There are a few things you will need to make this Chicken Korma Curry recipe. If you’re a regular visitor to the site you’ll know we use coconut flour quite a bit, as has a lower Syn value than regular wheat flour or desiccated coconut. 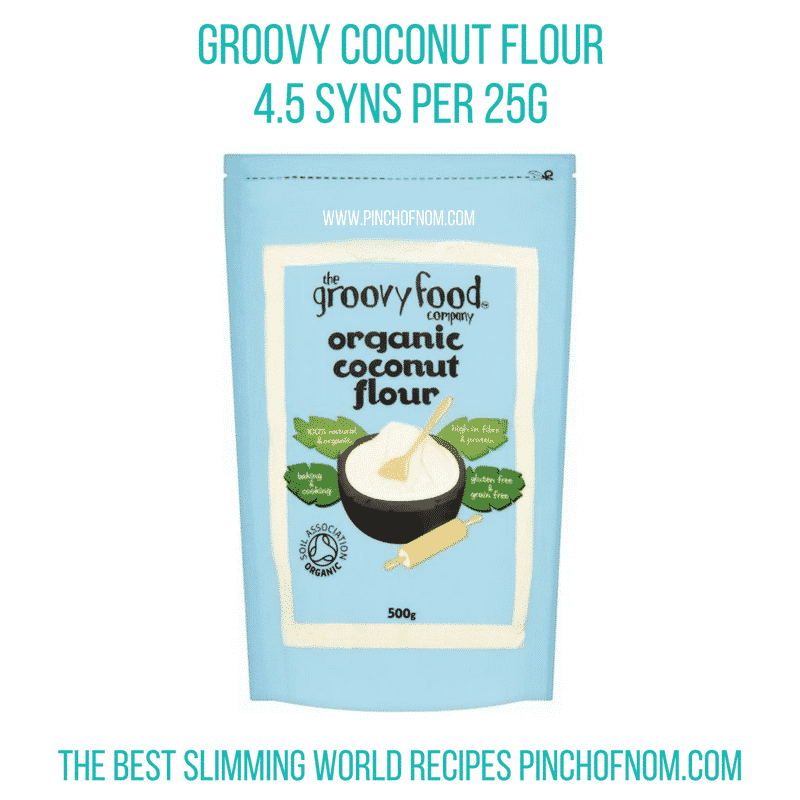 We tend to use Sukrin Coconut Flour as it is reduced fat and has a lower Syn value, but there are lots of other different brands to choose from, but don’t forget to check the Syns as it can vary! 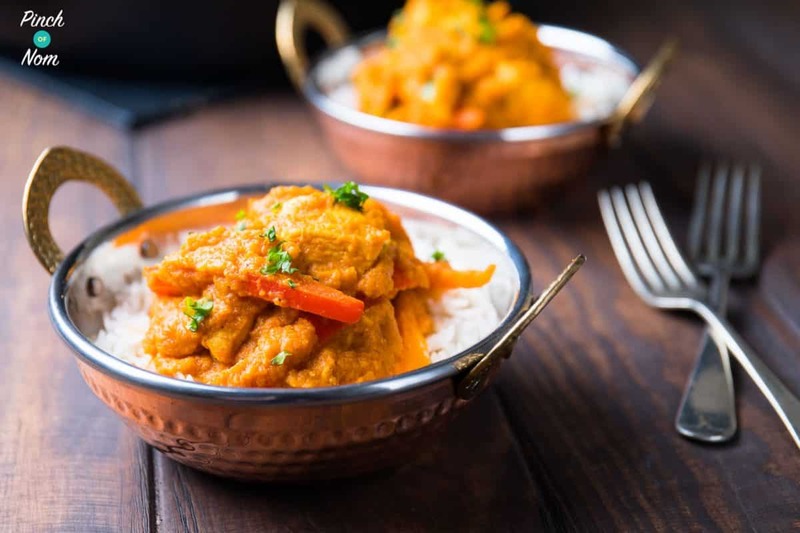 This Chicken Korma Curry recipe needs to be pureed to give the dish that thick, rich, creamy sauce that is associated with a traditional Korma Curry. 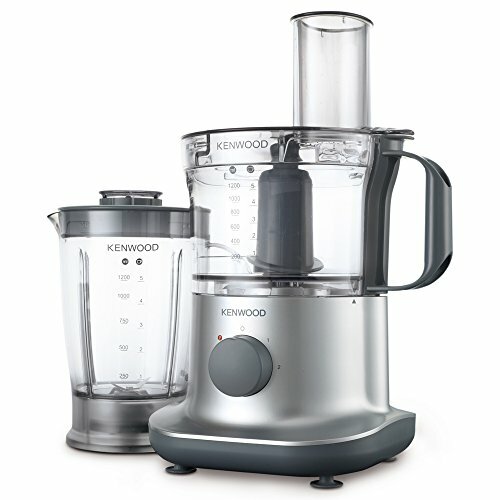 We use a Kenwood Food Processor like this one from Amazon. 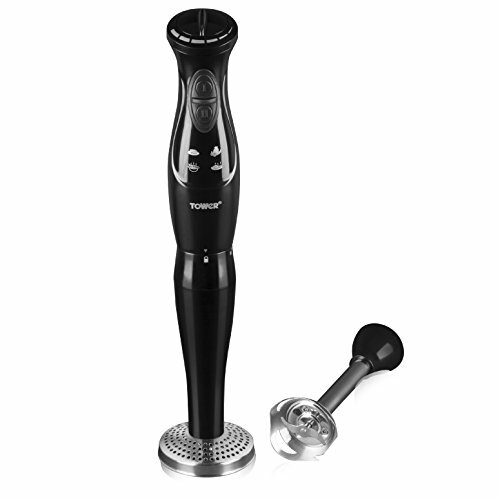 You could also use a hand or stick blender like this Tower Hand Blender. The Avocado or Coconut flavours are ideal for this 2 Syn Chicken Korma Curry recipe. 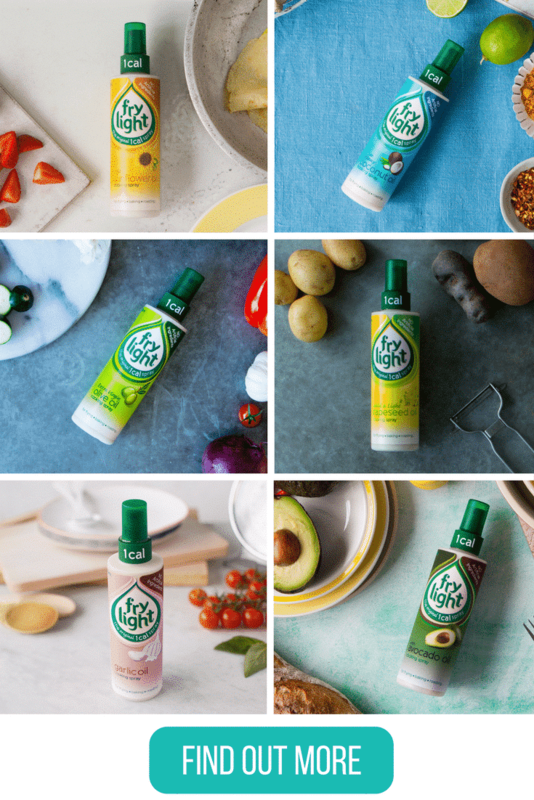 We like to use the Avocado! Ok, so these aren’t absolutely necessary, but if you’re looking to impress with an authentic Indian Fakeaway, served in authentic Karahi or Balti Dishes then you need some of these from Amazon. 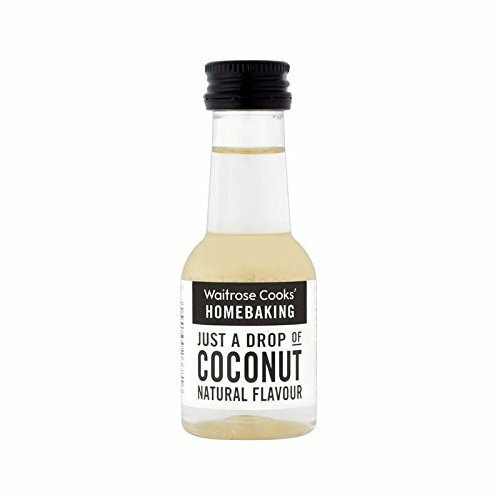 To add an extra depth to the coconut flavour, we’ve added some coconut essence. You can pick this up in most supermarkets, or from Amazon! 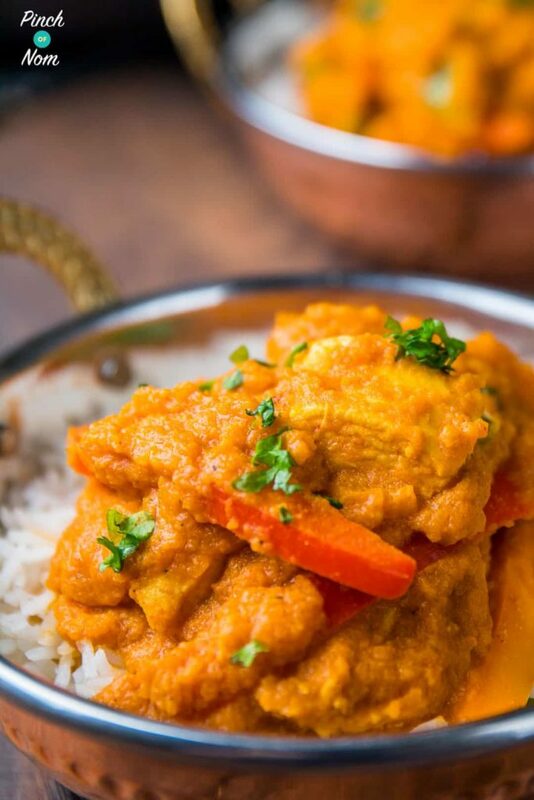 Can I make this Chicken Korma Curry in the slow cooker? Yes you can make this Chicken Korma Curry in your slow cooker! 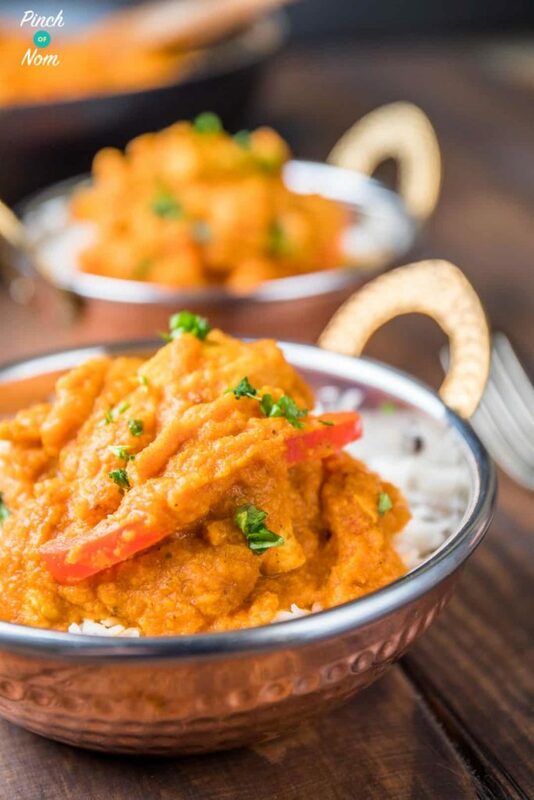 You can make this Chicken Korma Curry in the slow cooker, however, you will have to follow steps 1 to 3 and then add the paste to the slow cooker along with all the other ingredients. It will take around 5 to 6 hours on normal/medium. 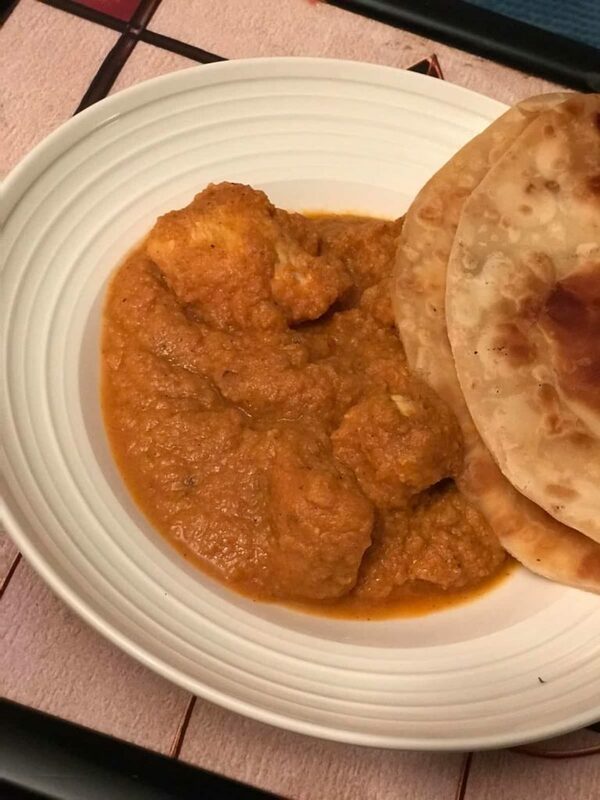 How do I make this Chicken Korma Curry? Place the diced butternut squash & carrot in a bowl along with 2 tbsp of water. 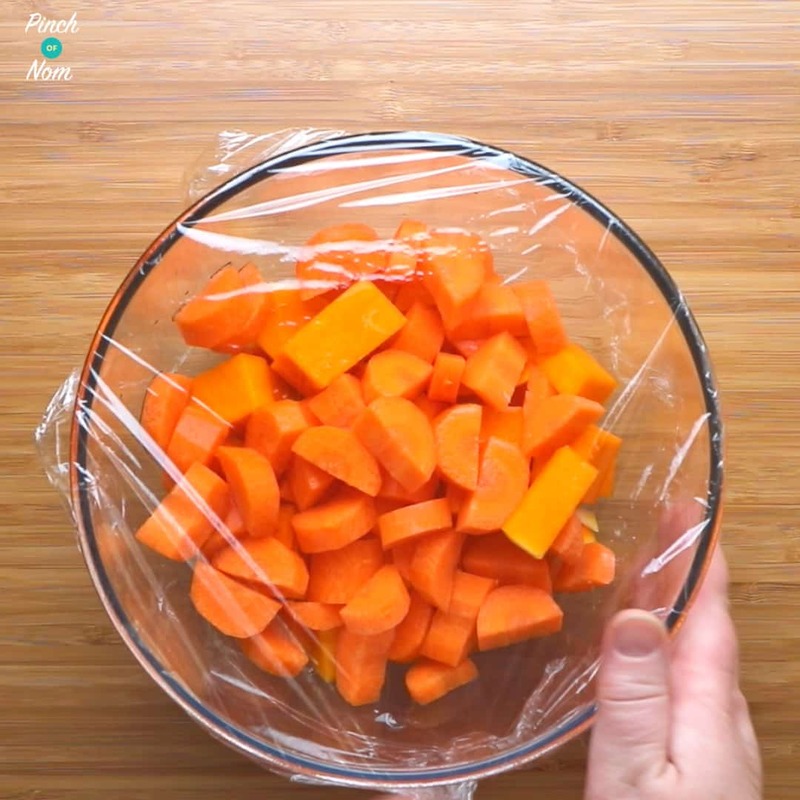 Cover with clingfilm and microwave for 7-8 minutes until soft. Meanwhile, spray a frying pan with Frylight and gently heat. Fry the ginger, onion and garlic until the onion has browned. 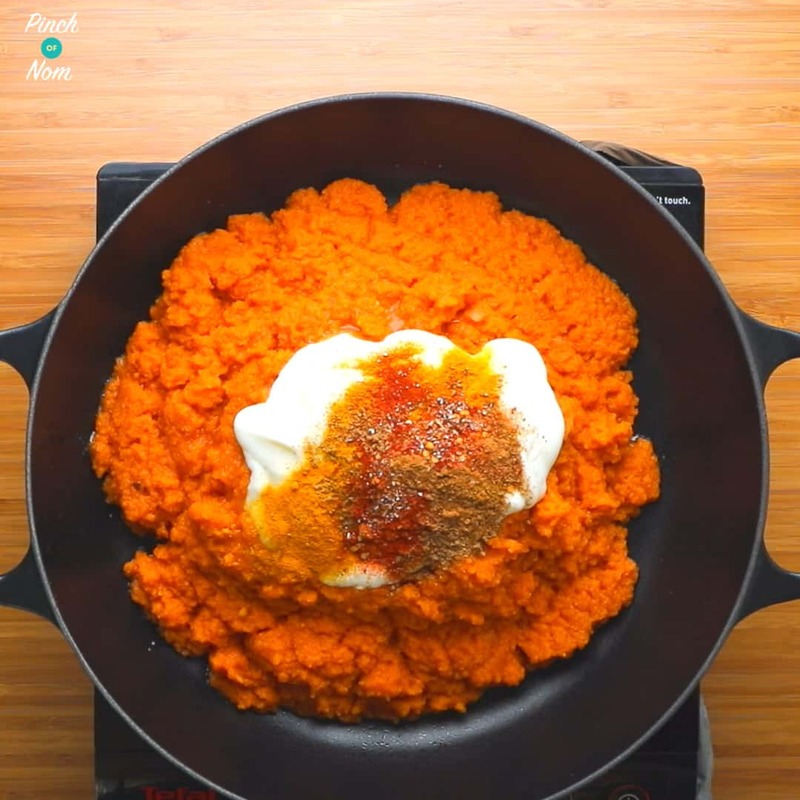 Once browned, empty the pan into a food processor (or bowl if you have a stick blender) along with the tomato puree, chopped tomatoes, 2 chicken stock cubes, coconut flour, and the cooked carrot and butternut squash (including the water in the bowl) – blitz until smooth. Spray a large pan with Frylight and gently heat. Pour the mixture from the food processor into it along with… the lime juice, Flora Light, the spice mix, granulated sweetener, yogurt and coconut essence. Stir Well. Add the raw diced Chicken. Simmer with the lid on for 20 mins making sure to stir often. You may need to add a little water depending on your desired thickness of the sauce. Once the 20 minutes are up, add the sliced peppers and cook for a further 10 minutes. Taste and enjoy! If you’d like it more creamy, just add a little more yogurt. Can I freeze this Chicken Korma Curry? Looking for some more Indian Fakeaway Ideas? Why not try these? 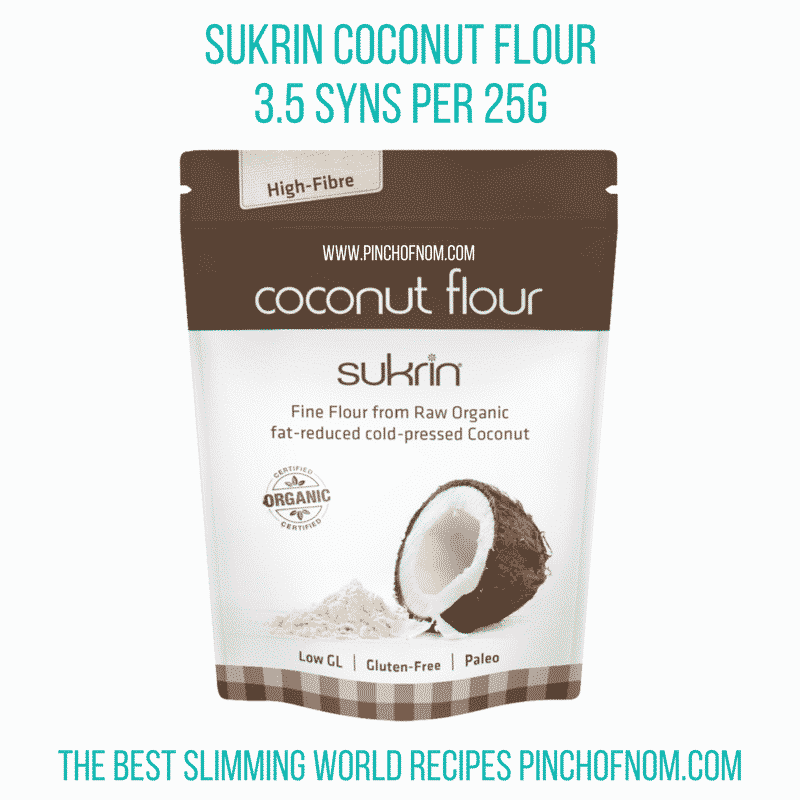 25 g Sukrin Coconut Flour 3.5 Syns - you can use other flours but check the Syns! 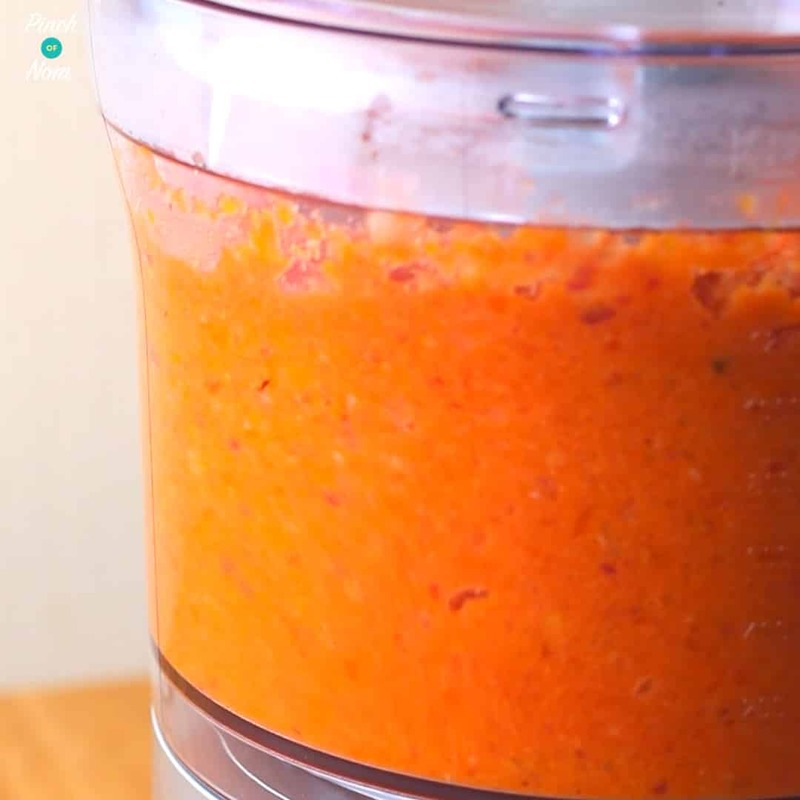 Once browned, empty the pan into a food processor (or bowl if you have a stick blender) along with the tomato puree, chopped tomatoes, 2 chicken stock cubes, coconut flour, and the cooked carrot and butternut squash (including the water in the bowl) - blitz until smooth. Taste and enjoy! If you'd like it more creamy, just add a little more yogurt. Empty the paste into the slow cooker and add all the other ingredients except the peppers. Cook for 5 to 6 hours on normal/medium. In the last 30 minutes add the peppers. Enjoy! If you have a soup maker you can use that. 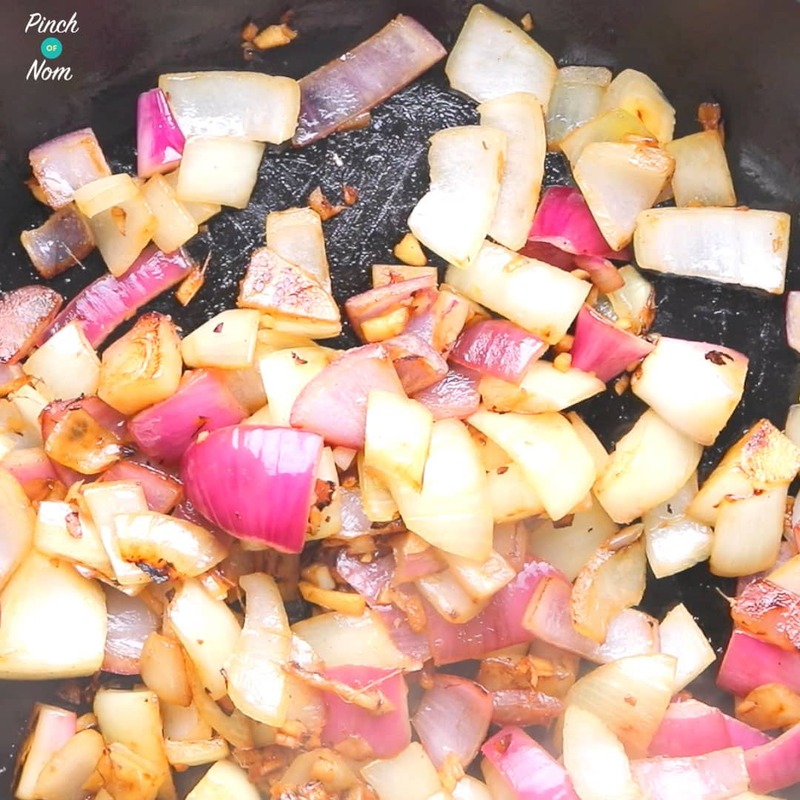 Saute onions garlic and ginger till light brown. Add spices. Cook out for 5 mins. Put in Soup makers with every thing else except chicken. Made this tonight for the whole family. My son was a little late arriving, so I popped his portion into takeaway containers. I was so chuffed as he didn’t realise it was home made. A delicious, thick, creamy texture and took 45 mins from prep start to eating. Unfortunately, I cant eat BNS as its on my list of no-no foods for my IBS. Can you perhaps suggest an alternative? Many thanks for such a gorgeous recipe! Does that mean you can’t tolerate any food from the squash family, pumpkin, marrow etc? You could try a root veg such as swede, which should mash down in a similar way, or possibly sweet potato. We’ve been working for some time to get the recipe right, so we can’t guarantee that it would be as successful, I’m afraid. Hi I dont use Flora Light or any other margarine I only use butter can this be used in place of Flora Light? We’ve used Flora light as it makes the dish much lower in Syns. If you use butter instead, you will need to adjust the Syns accordingly. Oh wow! I used sweet potato as couldn’t find my bns in the bottom of the freezer, but i don’t think it mattered. This recipe is ruddy lovely. Even my husband, who hates curry, cleared his plate. Thank you, I will be doing this again and again. Thanks for your comments, so glad you enjoyed it! It says to use Muller light coconut. I can only find coconut and vanilla. Is that the one? Can I leave the onions out of this recipe? Can you tell me how to cook this in my Instant Pot (newbie). Many thanks. There are several stages to this recipe that really need to be done on the hob. You could choose to cook the carrot/butternut squash in the pot, then use the pot from step 4 of the stove top method. If I wanted to instant pot in instead of slow cook how long under pressure? 15 mins? Made this tonight and adapted It to be dairy free for my daughters dietary needs. All I can say is AMAZING!! Exactly how a korma should be. Was reluctant to try it after trying many low fat curry dishes which have disappointed us. Definitely added to our favourites and look forward to having it again already. Thanks PON for another brilliant recipe! I have found a Shwarts Korma spice in my cupboard, if I use that, how much would you advice I put in? Thanks for getting in touch, Nicky! Hi this was the first time I have tried making any curry from scratch and OMG it is absolutely delicious. Nicer than any korma jar curry I’ve had and on a par with the korma we have had in a local indian buffet. Thank you so much for the recipe. Im going to see if you have a recipe for a Chicken Tikka curry now. Made today using the slow cooker instructions, it really is a good curry somewhere between a korma and plain curry sauce. The consistency is authentic and we made 7 decent size portions out of it as well! Will definitely make again. So glad you enjoyed it, Liz! If ingredients have a Syn value, we list them individually on the recipe card. This is so that if you need to substitute a brand (e.g. the flour) you can check the Syn value for the product you’ve used and adjust accordingly. I’ve just made this curry and it was lovely, I added a few more chillies and because i couldn’t get any I used lemon instead of Lime, vanilla yoghurt instead of coconut and I didn’t put garlic in as kids n hubby hate garlic. The best curry I’ve made SW style and will definitely be making again. Thank you so much for posting this recipe. It is honestly the best curry I’ve ever made and tasted and looked just like the takeaway version. It was also quicker to make than waiting on a delivery to arrive. There’s no need to add almonds to this recipe, it works pretty well as published. If you choose to add ground almonds, you’ll need to adjust the syn value accordingly. Instead of coconut yogurt or the other way, can you use light coconut milk? I don’t mind the syn value of using this but I was wondering if it gives the same effect?? I don’t have a microwave. Should I boil or oven cook the BNS and carrots? Thanks! I do not have a microwave? Would I be ok to boil to carrots and butternut squash to soften them to then be able to blend them or would this not work? Or could I put them in the oven?? Hi, I’m going to try this recipe tomorrow in my slow cooker, just wondered about it splitting if the yoghurt goes in at the start? Is the flora light the liquid one or from a tub of flora? Hi all love your recipes just a quick question asda do frozen butternut squash was wondering how much in weight do you reckon? According to Google (all hail the Google Gods!) it should be approx 3 cups of frozen butternut squash for the equivalent average sized fresh vegetable. Hope that helps! What else could i use instead of shot in coconut flour as cant afford?